Engineering Trainee(ME/EE/Civil/Chemical)- Passed BE/B.Tech/5 Year Integrated/Dual Degree in Concerned Engineering Discipline. Executive Trainee HR- Passed Graduation with minimum 60% Aggregate Marks and Full Time PG Degree/Diploma in HRM/PM/IR/Business Administration/Social Work/Labour Welfare with minimum 55% Aggregate Marks. Executive Trainee Finance- Passed Graduation and Qualified CA/ICWA/CMA. 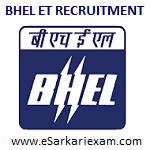 Eligible Candidates can Submit BHEL Engineer/ Executive Trainee 2019 Online Application at the Official Website of BHEL Latest by 6th May 2019. Applicants First Open BHEL Official Website. Open Current Job Openings Link in Career Section. Click on Recruitment Engineer Trainee, Executive Trainee(HR/Finance) 2019 Link. Select I Agree Link and Click Start Button.